One day in 1965, a dark-haired Czech woman, doubtless strongly perfumed with tobacco smoke, sat herself down in the studios of the French Erato record label, raised her hands to the keyboard of a harpsichord--even at that late date, more an exotic visitor from earlier days than a regular part of modern musical life--and sounded a few notes as tape rolled in the control room. Ten years and tens of thousands of notes later, she lifted her hands from the keyboard for a final time and made history as the first ever to record J.S. Bach's entire catalogue of works for harpsichord. Her name was Zuzana Růžičková, and in the years following World War II she had been carving out a place for herself as a fixture on the Czech musical scene and a valued visitor abroad. Erato issued the resultant LPs in a 21-record boxed set. 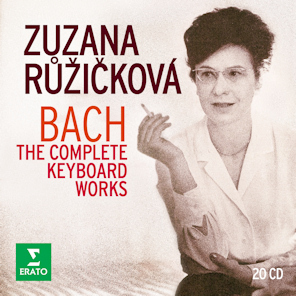 Last January, Warner Classics, corporate heir to Erato, reissued the set for the first time on CD, a 20-disc box timed to honor Růžičková on her 90th birthday. The tribute came none too soon; the artist succumbed to pneumonia this past Wednesday, September 27, following Nikolaus Harnoncourt, Sir Neville Marriner, and Růžičková's onetime student Christopher Hogwood as the latest in a series of losses suffered by the world of pre-"capital-C"-Classical music in the last couple of years. Růžičková developed a fine reputation in Europe, but hers was never a household name like those of Harnoncourt, Marriner, and Hogwood--or Wanda Landowska, in whose footsteps she followed in striving to restore the harpsichord as a living instrument instead of a museum piece. As a teenager, Růžičková had hoped to study with Landowska, but the war intervened. Still, the influence of Landowska molded Růžičková's musical aesthetic, which reflected 19th century ideals at least as much as 20th century scholarship into historic practices. Where a present-day scholar-musician would automatically choose an antique instrument or faithful copy, Růžičková sprang from the era when harpsichords were first returning to the concert hall after a couple of centuries of quiescence, and thus her roots were in the historically inauthentic instruments produced by modern builders of her youth. She enjoyed these modern instruments, with a multitude of stops, which she employed liberally for color, although part of her Bach cycle featured 1754 and 1761 original instruments. She was not above making changes to scores, either, as when she swapped a couple of preludes between books of Bach's Well Tempered Clavier, because she thought they better matched the corresponding fugues that way. Růžičková led a colorful life, much of it not in a good way. Daughter of successful department store owners in Plsen, she was a promising 12-year-old piano student who had recently begun mastering the harpsichord when the Germans overran Czechoslovakia, and being of cosmopolitan Jewish heritage, from that point until the end of the war she lived in peril and hardship. The Nazis sent her and her family first to Theresienstadt, where her father died, and then to Auschwitz. After a stint as a slave laborer in Hamburg, she ended the war in the notorious camp in Bergen-Belsen, Germany. Throughout this horrendous ordeal, she kept a scrap of a Bach score, copied in her own hand, on her person for consolation and a reminder not to lose hope; later, she would assert, "Bach tells you: 'Don't despair, there is a sense in life and in the world.'" Upon returning home, she almost immediately encountered her former piano teacher, who broke down in tears upon seeing what the years of abuse had done to Růžičková's hands. There followed a period of recuperation attended with ferocious work at the keyboard to regain her technique and qualify for admission to the Prague music academy. She completed her studies there, but because she and her husband, composer Viktor Kalabis, refused to join the Communist Party after it seized power in Czechoslovakia, the authorities harrassed them and refused to grant her the doctorate for which she had qualified. Life eased some after she won the ARD music competition in Germany in 1952, and she began to take her place as an important figure in Czech musical life, although the Communist authorities still confiscated most of the hard currency she earned by touring abroad. Only after the Velvet Revolution, which she and her husband actively supported, did she finally achieve the title of Professor that the Communists had denied her despite her status as a senior teacher at the academy. Among honors accorded to Růžičková were several from her native land and the French Chevalier de l'Ordre des Arts et des Lettres. Her recordings were awarded the Grand Prix Cros for J.A. Benda and the J.S. Bach set and the Diapason d’Or for Henry Purcell. Although Bach was always at the heart of her repertory, she covered a wide array of musical literature, from Baroque to modern, and inspired by her playing her husband composed several modern works for harpsichord, including a concerto, six two-part canonic inventions, and aquarelles. She was dedicatee or the performer entrusted with premiering a number of works by other modern composers, including Jan Rychlík, Emil Hlobil, Hans-Georg Görner, and Elizabeth Maconchy. I first made acquaintance with Růžičková's work back when I was in college, ca. 1980, and bought a two-record set in which she played a collection of Scarlatti sonatas and a single LP of her playing Couperin, both on Supraphon. As I'm recalling it, I paid a pretty penny for the Scarlatti set, the only one I could find with a particular sonata I wanted, K. 113 (L. 345), on harpsichord, those being the bad old days when records of Scarlatti on harpsichord were pretty uncommon. The Couperin, by contrast, I'm almost sure was in the "bargain" bins. All three records gave me much pleasure in ensuing years, although the Scarlatti wasn't necessarily the best from the standpoint of the recording engineer's art, at least as heard on my student's-bargain-basement equipment of the time. They had color and life not always evident in more "historically correct" performances. I never had the pleasure of meeting Růžičková or even hearing her in concert; records like those were my sole exposure to her art. It's that quality of bringing the music to life, however, that led me to begin this tribute with her artistic achievements, not, like most obituaries I've read, her ordeals during World War II. Although she reportedly was always very open about discussing her experiences, I can't escape the suspicion she would have preferred to be remembered not as a Holocaust survivor who played the harpsichord but as a harpsichordist who persevered and triumphed over adversity to bring light and beauty into a world always at risk from the kinds of forces that made the Holocaust possible. Hers was a unique voice, and in a lifetime of frequent struggle she ceaselessly raised it to enrich us all.